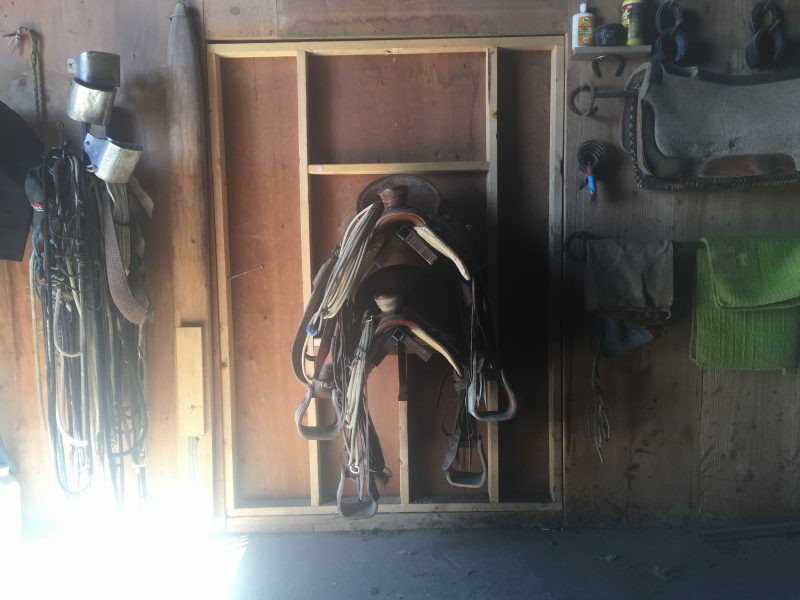 My husband Boe built a tack room into an existing quonset on the ranch here, and he implemented a really neat revolving saddle wall that makes saddling multiple colts and horses so easy. It eliminates scraping saddles through tight doors, getting in each other’s way, and slinging saddles up on fences. It really helps keep the tack room more organized as well. We got the idea from our friend Wendy Woldt of Idlewild Farms in Wisconsin. It was a pretty easy job for someone who is relatively handy, and the wall itself can be left fairly raw, like ours is, or finished out, and it can be made of many material options. Boe found two revolving metal brackets, one each for the top and bottom, and installed them in the middle of the wall. It can turn either way, and the back can be used for storage as well. It locks from the inside so that we can lock our tack room up tight. Check out the video of our Revolving Tack Wall. What do you think? Do you need one in your tack room?